Pelagios Commons invites proposals for short, self-­contained projects that develop resources related to the semantic annotation of place references in online materials. Resource development may take various forms—including (but not restricted to) tool development (compatible within the Recogito and/or Peripleo platforms), gazetteer alignment, or digitisation of resources—but must be reusable in multiple contexts and made freely available. Submissions will be judged by the Pelagios Commons Committee on the basis of their **value to the community more broadly** and in particular to the following Pelagios Commons Working Groups: Linked Pasts, Multilingualism, Pedagogy and Time. Timeframe: projects may start immediately after awards are granted (late April 2017), but *must* have concluded no later than 30 November 2017. Amount: funds of up to £4,000 may be awarded. Primarily the award should meet direct personnel costs for development time, though some essential travel for distributed teams is allowed. The budget *cannot* be spent on equipment, capital investment, overheads or other costs excluded by the Andrew W. Mellon Foundation’s grant guidelines. Payment: funds will typically be paid on receipt of a project completion report and demonstrable evidence of the resource. In exceptional cases partial payment in advance may be considered for non-personnel costs. Reporting: Projects should produce *at least three* reports, to be posted on the Pelagios Commons blog: one introductory post, a progress report, and a final report on its conclusion. Delivery: project leaders will be expected to present the results of their work at the next Linked Pasts symposium (venue TBC, end of November / beginning of December 2017). Travel and accommodation costs for one project member will be paid for by Pelagios. Licensing: resources produced by the project must be made available under CC­-BY, GPL, or more lenient licenses. v) a list of other project team members and their responsibilities. What is needed (in terms of the grant) in order to make this happen. Pelagios is a community-driven project. Applicants are encouraged to familiarise themselves with the activity of that community and to get in contact with Working Group leaders well in advance of the deadline, in order to consider ways in which their proposals might best serve (and leverage) the community. For previous award holders, and their updates, take a look at these posts on the Pelagios Commons blog. Another great episode of the Classics Confidential podcast is out. Quick, grab your headphones! For those who aren’t already converts, this podcast has been running since early 2010 and was founded by Jessica Hughes and Pelagios’ very own Elton Barker, both members of the Department of Classical Studies at the Open University. It’s a fantastic collection of interviews with classicists from all over the world who discuss their work on the ancient world. This latest episode is extra special, because it is all about Linked Data, and consists of a series of interviews with participants at the 2016 Linked Pasts meeting in Barcelona. Valeria Vitale (School of Advanced Studies, London), Maxim Romanov (University of Leipzig), Kai-Christian Bruhn (Institute for Spatial Information and Surveying Technology, Mainz) and Rob Sanderson (The Getty Trust) all discuss different aspects of Linked Data, what it means for scholars of the ancient world, and how it can be used to develop new approaches to sources and narratives. We highly recommend grabbing something warm (or cool, depending on your hemisphere) to drink, finding a quiet spot, and settling in for 20 minutes of excellent listening. Also, you really aught to join the Classics Confidential Facebook Group, and following them on Twitter @classicsconfide. We’re over the moon to announce that Peripleo, our prototype data visualisation tool has won the 2016 DH Award for Best Data Visualisation. This is a great achievement, since the tool is still in an early phase of development, and all credit for this win is due to our brilliant, patient Technical Director, Rainer Simon. We’re looking forward to some great advances in features and capabilities over the next few months. But it’s always wonderful to be recognised by our peers in the DH Community for what we’ve done so far. We’re also really happy and proud to be associated with the other projects which were nominated, runners-up and winners in the other categories. The DH Awards are a good barometer of the progress in Digital Humanities projects every year, and it’s great to see the diversity and range of work being done. Congratulations to our fellow competitors. And thanks to everyone who cast their ballots. We’re really glad you like Peripleo, and we won’t be resting on our laurels (sorry, couldn’t resist…). We’re excited to share the new version with you when it’s ready later in 2017. PS: Anyone interested in the statistics behind this years nominations and voting can see the breakdowns here. Pelagios Commons is proud to announce that two of our initiatives have been nominated in separate categories at the 2016 Digital Humanities Awards, the DH Oscars. Recogito is in the running for the award for best DH Tool, and Peripleo for best DH Data Visualisation. While there are no prizes for these awards, they’re a good barometer of the kinds of work and development that are happening in DH around the world, and we’re proud to be in such excellent company – to have Recogito and Peripleo recognised in the same league as some of the other nominees is great. If you would like to support us, voting is easy. Just head over to the DH awards website and look for Recogito in the ‘Best DH Tools’ category, and Peripleo in the ‘Best DH Visualisation’ category. You are allowed to vote once in each category, so, if you haven’t already cast your ballot, now is your chance. But hurry! Voting finishes on 25th February. While you’re there, do take some time to check out the other outstanding projects that have been nominated, and share the love. The Cross-cultural AfterLife of Classical Sites (CALCS) project has come to the end of its pilot phase. We introduced the project, and discussed its further development on this blog, and we’re now delighted to share our latest updates, after CALCS was presented to the Linked Pasts II conference in Madrid (14-16 December 2016) and the Digital Infrastructure for Named Entities conference in Leipzig (11-13 January 2017). We have added about 2300 Arabic and Turkish names (currently under revision) to the Pleiades Gazetteer, both ancient and modern. With this implementation of a widely used digital resource we wanted to show, or at least suggest, that many classical places, especially those around the Mediterranean Sea, were immersed in a complex, rich and multilayered cultural life, that is mirrored, among other things, by the plurality and diversity of their names. We also see the addition of Arabic names as a resource to enhance the understanding of how place-names changed, evolved and influenced each other, from a philological perspective. During the past months, we have involved communities of Arabic students and researchers in the annotation of classical places via the Recogito platform, and into the identification and addition of Arabic place-names directly in Pleiades, with the intent of amplifying the role of Arabic scholarship, both past and present, in the study of Classics. The bulk upload mode that we designed (and presented on this blog), is being implemented by the Pleiades developers and will soon be available to everyone, speeding up and making more efficient the process of contributing to the gazetteer. We want to stress that the bulk upload mode is not exempt from the editorial curation of Pleiades data. All information introduced, regardless its mode, has always to be vetted and approved by the Pleiades editorial board. The new place-name entries we uploaded within the CALCS project are, as well, now undergoing the traditional review process and, only after that, they will be visible to all users on the Pleiades gazetteer. Thanks to the insight of our colleague Ryan Baumann, we developed a little python script (available on github) that extracts all the places in Pleiades that fall within the borders of a given modern country, and exports them in a tabular format, which can be annotated in a spreadsheet by our collaborators with the addition of Arabic and Turkish (etc.) names, and then in turn imported into Pleiades with the new information. Besides this particular application that facilitated our workflow, enabling contributors to focus only on the places that were of interest to them, this script might prove useful in other contexts too, when filtering data from Pleiades. CALCS was a very exciting project for us and for the people that contributed to it through workshops, schools and seminars. It is not surprising, then, that we have been thinking of possible future developments that will be, ideally, taken over by communities of students and researchers in Arabic and Turkish speaking countries. From our perspective, it would be interesting to use the current bulk upload mode, that only allows one to add names for places already in Pleiades, as a starting point to build a more complex version, that also enables the creation of new place-entities in the gazetteer. Another line of development that we would like to pursue is the addition of pre-classical names of ancient places, especially those around the Mediterranean. If CALCS was about the cultural afterlives of classical site, why not think of the previous lives of those places as well?! We also believe that a project like CALCS has highlighted the importance of looking at places as cultural entities, and how the idea of a place can change not only through time but also across different contemporary cultures. In this sense, CALCS seems to be an excellent starting point for projects that gather and compare different views of the same place, and the different connotations that have been assigned to it. Our spreadsheet is still public and available via our github page. Please, feel free to add more Arabic and Ottoman names and sources at any time, and to use CALCS as teaching material in classes and seminars. You can also request access to the maps that are available on the CALCS account on Recogito and contribute to the annotation of them. A new year means new faces! Pelagios Commons welcomes two new staffers on to the team, both working on the community side of the project. Valeria Vitale and Rebecca Kahn have been hired to help develop our community support for newcomers and established users. I have joined the Team as one of the two new community managers. My job will involve strengthening and supporting the existing communities of contributors and facilitate the use of the Pelagio’s digital tools, especially in a pedagogical environment. After completing my MA degree in Communication at La Sapienza, Rome, I worked with several Italian cultural institutions, creating digital products to enhance public engagement with cultural heritage, building and maintaining relationships with students, teachers and other groups of interest. After seven years of involvement with the study and communication of tangible and intangible cultural heritage, I decided to move to London, where I studied Digital Humanities at King’s College. I have just completed my PhD, in the same institution, with a research on the use of Linked Open Data to document 3D visualisation of ancient heritage. I have collaborated with a number of academic projects involving digital gazetteers and spatial humanities, such as the Heritage Gazetteer of Cyprus, i.Sicily, Pleaides, the Heritage Gazetteer of Libya and CALCS. Mostly, because I have a fondness for obscure place-names. My role at Pelagios Commons is to work on the community side of the project, and to broaden our network of collaborators and contributors, and extend our work with museums, libraries and archives. I’ll also be working with the team to make our site and tools easier to use for newcomers and established users alike. And tweeting. There’ll be a lot of that too! My research interest is in digitisation and museum collections and how digital cultural heritage is used to represent cultural identities online. I did my undergraduate BA at the university currently known as Rhodes, and an MA in Journalism at the University of the Witwatersrand in my native South Africa. After that, I spent several years working in advocacy and civil society as a researcher on questions of open access, scholarly communication and digital IP and copyright reform. An increasing interest in digital cultural heritage led me to the UK, and to King’s College, London, where I did another MA in Digital Asset Management (which resulted in an MA.DAM, which I think is a lovely touch) and my PhD. For my PhD I studied the effect of digitisation on national cultural heritage institutions and their collections, with a specific focus on the British Museum. I like museums, and I like the internet, it seemed like a good match. On December 15, 2016 I presented work on a project titled Linked Places at the Linked Pasts meeting in Madrid, on behalf of my collaborators Lex Berman and Rainer Simon, This second phase of Linked Pasts was generously supported in part by a Pelagios Commons Resource Development Grant, The following final report replicates a 10 December posting I made on my own blog, at http://kgeographer.org. The experimental demonstration app produced can be viewed at http://topotime.org/linkedplaces; the GitHub repository holds all code produced: https://github.com/kgeographer/topotime. The tag line for the Pelagios Commons web site is, “Linking the Places of our Past,” and that project is indeed facilitating the linking of historical place attestations published in digital gazetteers. From my perspective (and many others’) , the initiative is going great, bravo! There are other ways that places are or have been linked and I’ve been plugging away at a facilitating representations and analysis of those connections in a couple of ways. The first was The Orbis Initiative, an ambitious and sadly unsuccessful NSF grant proposal to develop software and systems for extracting information about roads, rivers, canals, railways, and footpaths–and the places connected by them–from the million or so high-quality scans of historical maps. That data is of the physical channels (a.k.a. media, ways) used for the movement of people and goods across the earth surface. Although the grant wasn’t awarded, I’m happy to say a manageably-sized portion of the work it described was taken up by the CIDR team at Stanford University Libraries, just as I was leaving (amicably) in September. I expect fantastic results! Since that work on geographic networks is in such good hands, I’ve begun to focus on the other side of that coin, the movement over such networks: individual journeys, named historical routes and route systems, and flows. I’m calling the project Linked Places, and a mini-grant from Pelagios Commons has helped to jump-start it. It’s part of my larger DH/GIScience research frame, Topotime, which has a broad goal of joining Place and Period in data stores and software for historical research and education. At the moment, the Linked Places work dominates the Topotime GitHub repository, but I’ll break things out soon. Enough context, this blog post is intended to describe the status of the Linked Places work products. I’ve described the goals of Linked Places and its early results in two blog posts on Pelagios Commons earlier this year (July and October respectively). In Phase One, Lex Berman and Rainer Simon joined me in clarifying a conceptual model for what we wanted to do, refining a provisional spec for a GeoJSON temporal extension (GeoJSON-T), then adapting the GeoJSON-T format for representing route data. We agreed on the term route for an overarching class encompassing journeys, flows, and historical routes and route systems (hRoutes). The conceptual model was then “expressed” in the GeoJSON-T form (Figures 1 and 2). In Phase Two, I holed up in beautiful Ascoli Piceno to a) convert five exemplar data sets to a generic CSV form, b) write Python scripts to transform that CSV to GeoJSON-T and to populate an ElasticSearch index, and c) build a demo web map application that consumes GeoJSON-T data and puts it through some paces. That app, which mashes up Leaflet/Mapbox map with a Simile Timeline, is not designed as such–it’s been thrown together for discussion about what real apps might be interesting. I will be presenting this now completed Phase 2 work at the Linked Pasts workshop in Madrid, 15-16 December 2016. 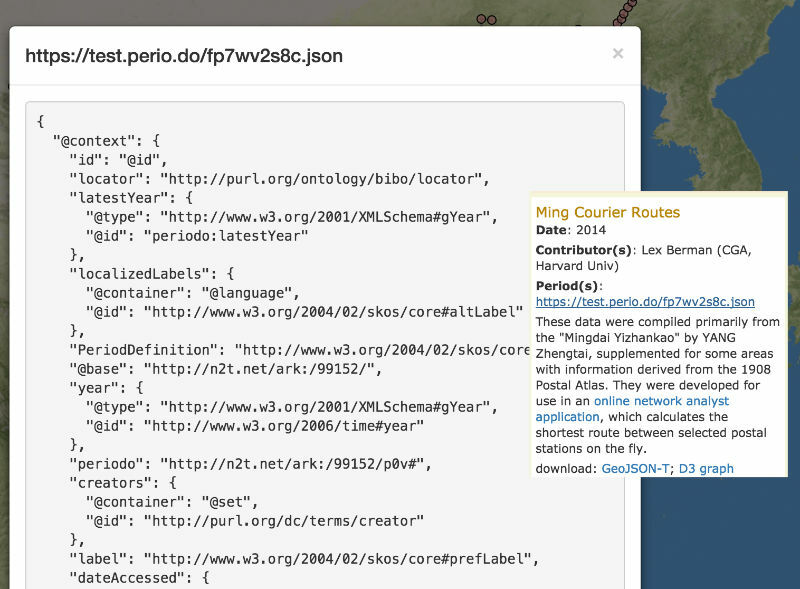 GeoJSON-T simply adds an optional “when” element to native GeoJSON. That “when” is typically placed at the same level as a “geometry” element (the “where”), which can appear in a couple of places: as a top-level attribute of a Feature (Figure 1), or, in the case of routes data, as a member of a GeometryCollection (Figure 2). 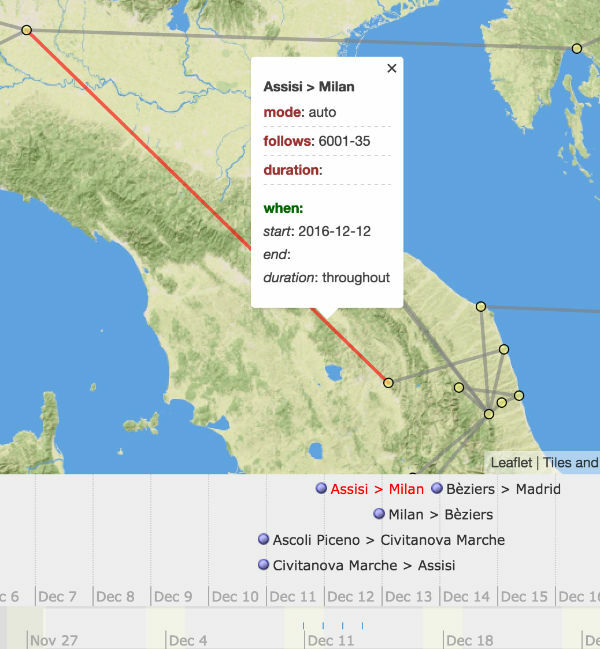 The GeoJSON GeometryCollection is a relatively infrequently used construct, but is essential to how we represent journeys and hRoutes. There is some more explanation on the Github wiki. I’ve made the assumption that a large proportion of historical route data will be developed in spreadsheet or CSV format natively. Attributes and coding terminology will of course be distinct for every project that develops data. There’s nothing to stop anyone from creating GeoJSON-T route data from scratch, by whatever means, but if a researcher can rearrange their CSV data in a standard form, it can be converted and ingested automatically for use in the existing demo or future GeoJSON-T compatible applications. Following these, data files can have any number of further attributes/columns, which will appear in various ways within any given app. A complete accounting of these fields, and further details about data preparation and the Python conversion/ingestion scripts (csvToGeoJSON-T.py and elastic.py) will appear on the GitHub repository wiki soon. If you are anxious to play with this stuff before then (or afterwards), get in touch with me directly. The GeoJSON-T format and its implementation for route data allows for some interesting display and analysis possibilities. The app so far only explores the visualization side. I’m planning to follow up this work with at least two “real” applications that do more: one for data exploration and discovery across a large distributed corpus/repository, and a second that allows manipulation and analysis of a given network of geographic movement (e.g. commodity flows like Incanto Trade, or route systems like the Ming Courier Routes). I’ve identified a few other exemplar datasets and welcome inquiries for collaboration. The results of this work: a conceptual model for routes (journeys, flows and historical routes/route systems), the GeoJSON-T extension, its implementation for route data and reliance on CSV input, and last but not least the map/timeline mashup, are all provisional and experimental. The models have been tweaked (‘refined’) as requirements come to light, and that should continue for at least a little while longer. I welcome comments — here, on twitter (@kgeographer), via the project GitHub repo, or by email: karl[dot]geog[at]gmail[dot]com. With not so fashionable delay, I am reporting now on the second phase of our work. This phase started in October, when in the midst of the Jewish holiday deluge, our data whiz, Glauco Mantegari, came to Jerusalem to work with us on KIMA, the Hebrew Gazetteer. Having no center or institution to call our own, we were working in various chosen locations in Jerusalem and Tel Aviv, and the names of the places we frequented, with their stories, echoed our work. It is only appropriate, therefore, to start with the picture of Glauco Mantegari refining data on the slope of the notorious valley of the son of Hinnom, גיא בן הינום, which, with the ages, gave its name to the idea of hell and the purgatory: Gehenna. The evening was warm and pleasant, but on the screen, the purgatory of google refine was hard at work in an heroic attempt to bring order and meaning to a gigantic mess of historical data. The intensive week of work in Jerusalem started with meeting our data providers, in order to discuss with them their conventions of the data. Each provider had other ways of formulating temporal information, certainty, accuracy and historicity (e.g. expressions “Not before”, “around”, “probable” or “cataloger addition). First, was the Academy of the Hebrew Language. The Academy was established in 1953 with the mission “to direct the development of Hebrew in light of its nature”. One of its core projects is the preparation of a Hebrew Historical Dictionary. For this purpose, it created a database of texts of the different historical language strata, where each word in each historical text is analysed for its syntactic and semantic features. The corpus includes texts of all the extant Hebrew compositions from the time of the canonization of the Hebrew Bible until the end of the Geonic period, some Medieval Hebrew texts and large selections of Hebrew literature from the mid-18-th century until the founding of the State of Israel. From this cornucopia of language we received a total of 68108 textual attestations for 3,678 unique place names, in various forms and spellings. We have complemented these with 6, 351 attestations of place names from the Hebrew Bible, which were kindly extracted for us by Dirk Roorda and Martijn Naaijer from SHEBANQ. The biblical place names were collected from a digital version of the Biblia Hebraica Stuttgartensia (BHS) which was made available in the text database of the Hebrew Bible behind SHEBANQ, a system for the study of the Hebrew Bible. While the data we received from the Academy and from SHEBANQ was extracted from the body of texts, our second main data source is of different nature altogether: the library catalog. Our provider here is the National Library of Israel, which made available two catalogs and one large Thesaurus of authority files, titled “Agron”. The first catalog, the Bibliography of the Hebrew Book, is the fruit of many years of work on a project that documented over 100,000 records of known printed works of Jewish languages​​, found in collections in collections in Israel and abroad, and which were printed from the time of early press in the mid 15th century to 1960. The second is the catalog of the National Library itself, that amounts to 300,000 Hebrw records. What makes these catalog records valuable for a Gazetteer is the librarians’ loyal practice of documenting, in a designated field (260a MARC record) the historical name of the place of publication as it was written at the time of printing, normally on the title page. Conveniently for us, in many cases a normalized form of the place name was entered by the cataloger in a separate field, and the most fortunate cases are when they were linked to a normalized, authority record place name, such as that kept in the library’s “Agron”. Having learnt from our data providers their various conventions, the next step was conjuring a Geo-Json Schema that would enable to translate the data from the various sources and aggregate it in one structure. The weeks that followed were dedicated to translating the data from the various sources to the schema, adjusting it when needed, and finally, matching and joining them together. This is where challenges of messy and big data surface, from hidden encoding variations (even within one encoding system!) to our computers protesting and fainting from the hard computation labor. But we will prevail! the first version of the core of our Gazeteer will be at Pelagios soon. While assisting the Gazeteer making processes by scripting and parsing, Our team’s developer Dimid Duchovny was also working with Pelagios’ Rainer Simon on adapting a plugin for Recogito to enable automatic, as well as manual mark up of Hebrew place names. To test the plugin, I evaluated a preliminary automatic mark up of a medieval text that I manually marked in advance: the Journeys of Rabbi Petachia of Regensburg. This revealed the predicaments of Hebrew NLP: first and foremost, the lack of vowel letters creates multiple ambiguities: the word אולם, for example, may be read as the name of the German city of Ulm, but also as “Ulam” the Hebrew word for “but”. This is a problem that could only be reduced by morphological analysis of each text, or by automatic addition of vowel diacritics. A second interesting predicament, caused by Jewish and Israeli geographical history, is apparent in the mark up: several person names mentioned in the Medieval text, such as Amazia, Tuval and Rabbi Petachia’s own name – all traditional, biblical person names – are detected and marked as place names in the text. Indeed, in the 20th century, newly established Kibbutzim and Moshavim were named after ancient kings and heroes, thus creating a challenge for linguistic disambiguation. And vice versa: many modern Hebrew names are given after place names, whether biblical or not. This is a problem that could be solved in future versions of Recogito, if a choice will be given to select temporal subsets of the gazetteer. For both these problems, at this point, we have to rely on manual correction through Recogito’s validation function. Having the data openly available, however, we hope it will attract NLP scholars who would take the challenge of training their named entity recognition software and applying it to KIMA. We have been building the CroALa Index Locorum for three months now, and the end is in sight. Our working corpus is ready; it includes five Croatian Latin texts, two prose works — a funeral speech by Nikola Modruški from 1474 and a history of South-Eastern Europe by Ludovik Crijević Tubero, finished after 1522 — as well as three poetic texts, a mythological epic by Jakov Bunić (1490) and collected poems by Ilija Crijević (1463-1520) and Marko Marulić (1450-1524). Each of these works exists in a special XML edition tokenized to the level of words; each word has been assigned its own unique CTS URN address. Looking at what we have learned (and what we’re still learning), the stuff seems to fall into one of three categories. There were technical problems to be solved, linked data infrastructure and sources that we were lucky to be able to build on and reuse, and conceptual issues — the main cause of our collective headaches and just-don’t-get-into-metaphysics agonies during meetings. Below are highlights from each category for you to choose according to preferences and inclinations. Last month Lex Berman hosted Rainer Simon and me for three days at Harvard’s Center for Geographic Analysis, to consolidate understandings from remote discussions about our Linked Places project, and to move the work forward. We made excellent progress. Coincidentally, members of the Linked Data for Libraries (LD4L) project’s geospatial working group were meeting simultaneously on campus and we discussed historical gazetteer requirements with them in a working meeting. We also presented on our work, and Pelagios generally, before a wider audience in a 90-minute lunchtime seminar and over a raised glass or two one evening. Linked Places aims to create a provisional data model and standard formats for representing historical geographic movement as well as some prototype software for managing and visualizing data in those formats. We began by refining an earlier version of the following figure; an explanation follows. Our first step has been to agree between ourselves on the entities involved, the relationships between them, and a provisional vocabulary. Many of the possible terms have multiple and overlapping meanings, so this is not a simple matter and no solution will please everyone. What is essential is that there be a sound internal logic, and that linking with existing models, formats, and systems be facilitated. A route describes an attestation of one or more occurrences of the movement, on or near the earth surface, of people, commodities or information between two or more places, at some time during or throughout some time_period. Routes are composed of one or more segment, each of which is composed of two places and a path (corresponding to nodes and edges in network parlance), the locations and temporal attributes for which may or may not be known or specified. Movement between places may have been uni- or bi-directional. A journey is a record of a specific instance of travel by one or more individuals. Examples include: the 7th century pilgrimage of the Buddhist monk Xuanzang across China and India; the first voyage of Captain James Cook, between 1768 and 1771. A flow is the record of the movement of something (commodities, people, ideas) between two places, aggregated as a magnitude, throughout some period. Examples include: the number of captive Africans conveyed between West Africa and Bahia in the 17th century; the volume of letters between correspondents in Paris and Prague in the 18th century. A historical_route (or hRoute) asserts a single or composite course of travel between places, taken repeatedly by unspecified individuals over time, usually for purposes of commerce. Examples include the Silk Road, Ming Dynasty Courier Routes, and the medieval Amber Routes. 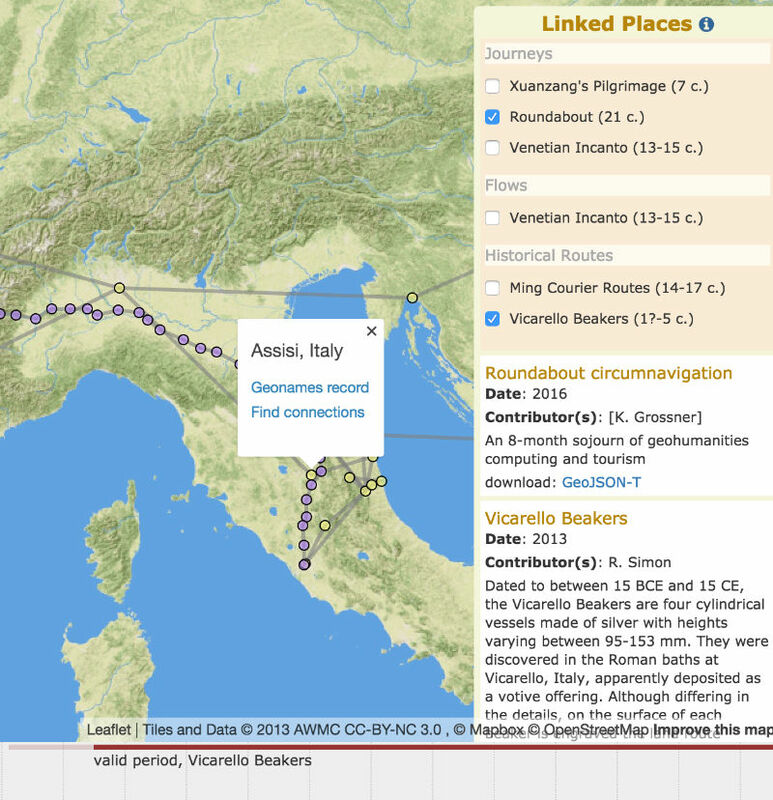 Some correspond with named roads, for instance the Via Salaria in Italy. This is network data, right? Right. It will be apparent to most or all readers that the places and segments above correspond to the standard graph abstraction of nodes and edges. In this work we’re proposing a preliminary specification of core spatial and temporal properties for the nodes and edges of historical movement data. One product of this work will be scripts to convert data between formats, including the new GeoJSON-T (discussed below), CSV, RDF, and one or more graph format such as GEXF. Network data for routes is almost always either partially or entirely geographically embedded. In most cases, places have known or estimated point geometry. Paths in historical data are less frequently known, and are often estimated—for example with least effort hiking functions computed over modern day topographical data. Our model must also account for cases where geometry for paths and/or places is unknown or not recorded, including data about fictional routes. For this work, the jumble of potentially relevant terms included: journey, itinerary, route, path, trajectory, course, way, and flow—all of which relate to the movement of stuff (things, people, ideas, knowledge) between two or more places at some time during or throughout some period. Periods might be at any scale or precision, and described by names, intervals, or both. A distinctive characteristic of this domain is that the same occurrences may be considered as more than one type of route. That is, the same data may possibly be used to produce one or more journey, flow, or hRoute dataset in any combination. For example, our Venetian Incanto Trade dataset in its original form is a record of individual journeys. We can (and have) aggregated these by any of several attributes as flows (e.g. year, patron, terminus). The apparent agreement within the historical gazetteer community about the meaning of “place” is no small achievement—per Pleiades, they are concepts that are “…contexts for Locations and Names”—but is not truly and formally universal. For example, the alignment of the Pleiades definition with the scope notes of CIDOC-CRM’s E53_Place (“…extents in space, in particular on the surface of the earth, in the pure sense of physics: independent from temporal phenomena and matter”) is imperfect. However, an E53_Place is_identified_with place names (appellations) and is_defined_by spatial primitives (locational geometry), so perhaps they are close enough. Fortunately, while we as a community sort out whether that matters, work can proceed. We have nearly finished tweaking the GeoJSON extension I’d been working on for a while (called GeoJSON-T, the “T” is for time) to ensure it can fully express this conceptual model. Once that’s done, I can refine the scripts already written for transforming our exemplar route data sets into GeoJSON-T (https://github.com/kgeographer/topotime/wiki). 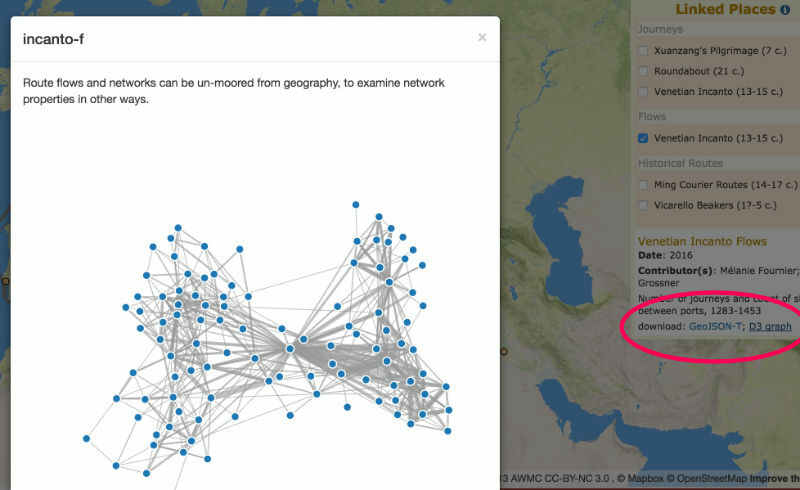 We’ll also need a script to export GeoJSON-T to the Pelagios RDF Interconnection format. 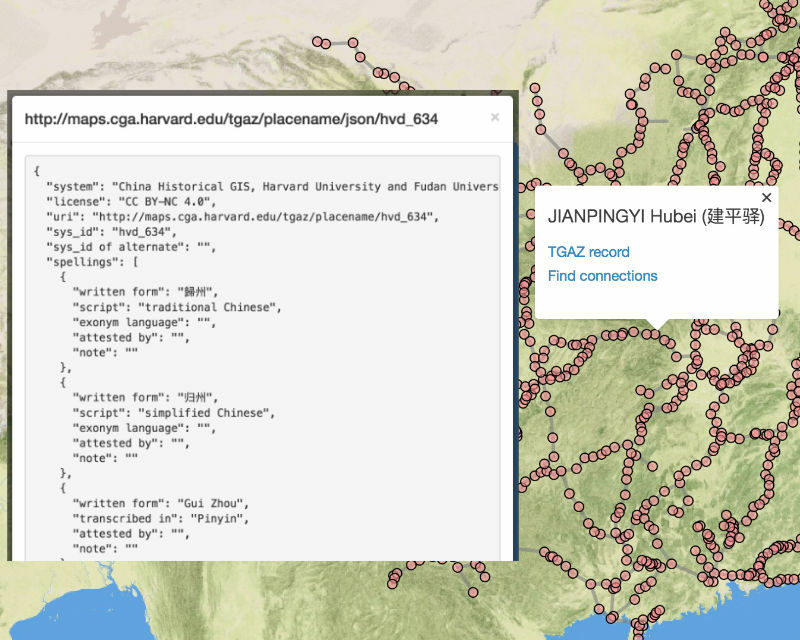 Lex will be testing possible alignment between the T-GAZ (temporal gazetteer) format he has developed and GeoJSON-T. As it stands, RDF for the places in our early route data examples can be readily rendered in Peripleo, confirmed by Rainer’s quick hack in Cambridge last month. There is an open question about whether to generate a simple RDF serialization of segments so Peripleo might render them—as straight lines, or as paths if actual geometry is given. Finally, I will create the prototype map and timeline interface mentioned earlier. 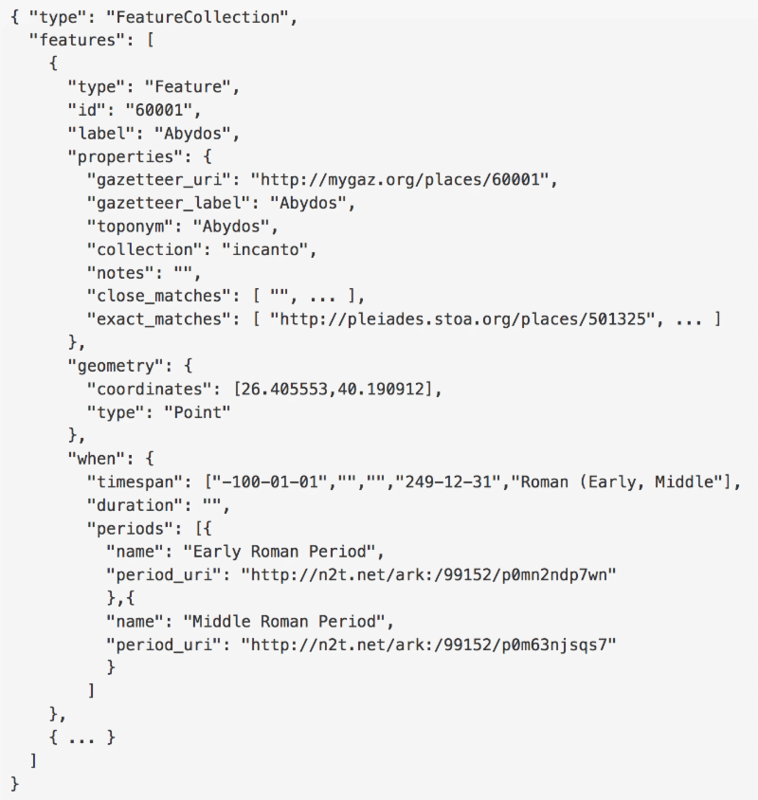 It should be noted that GeoJSON-T is (or could be) an appropriate format for use by any historical gazetteer. Although there needn’t (shouldn’t?) 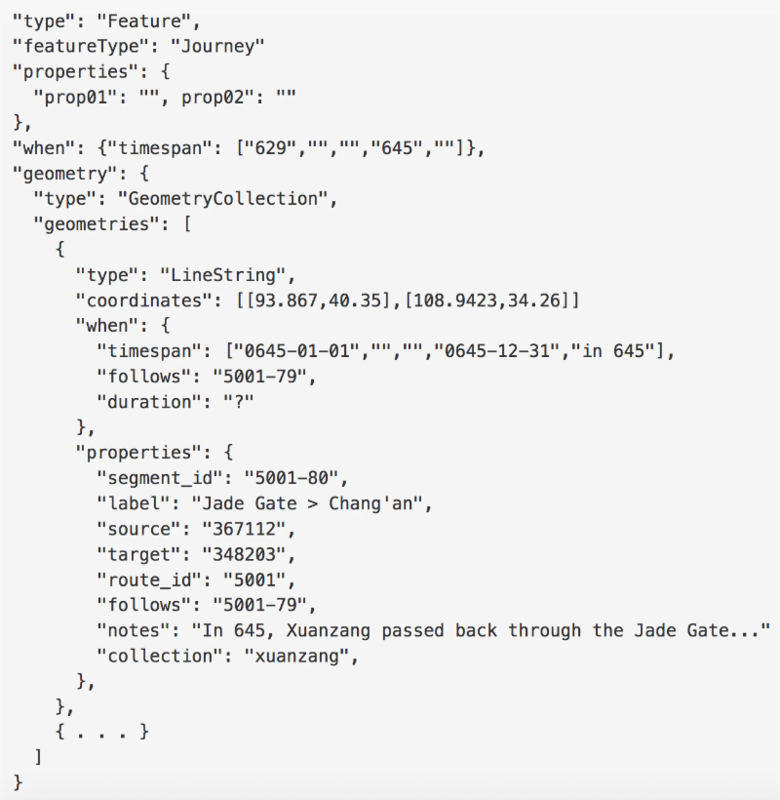 be a single gazetteer data model, a recent Pelagios Commons discussion indicates interest in best practices for gazetteer development incorporating the GeoJSON format and I think GeoJSON-T is worth a look. I will be presenting our sample datasets, associated scripts, and the prototype interface at the Linked Pasts meeting in Madrid this December. In the meantime, comments are welcome! The ODP approach to ontology engineering is gaining traction in the Semantic Web community; cf. Blomqvist, E., Hitzler, P., Janowicz, K., Krisnadhi, A., Narock, T., & Solanki, M. (2016). Considerations regarding ontology design patterns. Semant. Web, 7(1), 1-7.